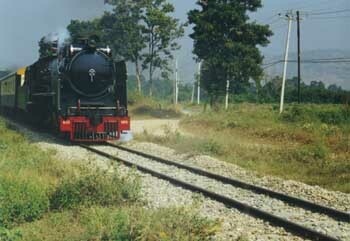 Ever since I was a kid in Britain at the end of the 50s I have had a fascination with steam trains. 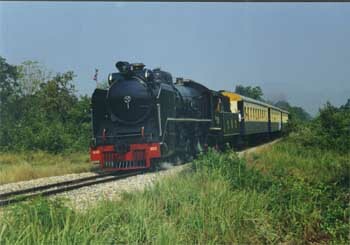 When I read the New year's day edition of the Bangkok Post, I was pleased to read that, as part of the Amazing Thailand tourism drive, the railway company had started up a steam service along part of what remains of the Death Railway, built by prisoners during World War 2. Thursday was a bit late to go dashing off, but I decided that Friday--also a public holiday in Thailand, would be about right, especially as I had no intention of going for a ride on Sunday when the world would be driving back to the City of Angels. I needed a day out anyway. My head is spinning from writing about and discussing the new Internet Law that is about to be foisted on the unsuspecting users in Thailand. As this is Thailand, no one really minds if you wander about so I crossed the tracks and took plenty of up-close photographs of the pair. 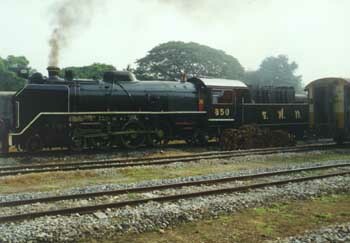 They are 4-6-2 one- metre gauge locomotives numbered 850 and 824. 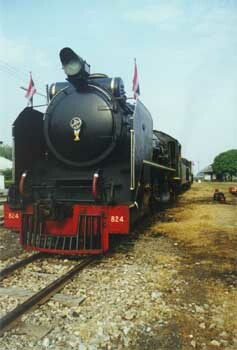 A brass plate on 824 showed that it was built in Japan in 1949. 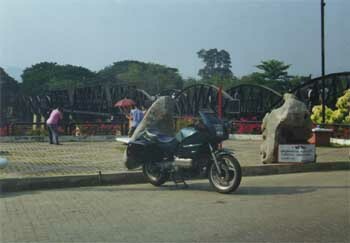 Like the repair of the famous bridge, this may have been part of war reparations. I had originally intended to leave the bike and let the train take the strain, but first I needed some more film for the camera, so rode back into Kanchanaburi. Once I had got the film from a sleepy shopgirl, I parked the bike up at the station and came across the first problem: I had forgotten my sandals. I did manage to get the trousers over the boots, but it was going to be hot. 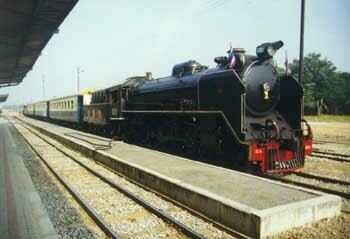 The front locomotive was already coupled up, and as I came onto the platform the rear one was just pulling in. Then the ticket office opened. While queuing, I had a look at the schedule that had been posted in English as well as Thai. I also noted that the ticket seller, spoke English, as many people do these days. The price for the trip was 150 baht single, 250 baht return. That is about $5 - $6. 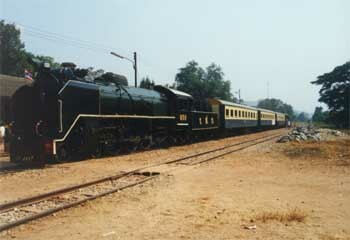 On the schedule, the times were organised in such a way that the return to Kanchanaburi would not be until 1630 which was too late for me that day. 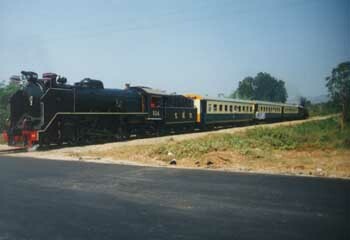 This timing is partly due to the turn-round time at Wang Po, where this service terminates, giving passengers plenty of time to eat and wander around. This lack of time has long been a criticism of the regular service up to Saiyoke Noi, so here was a plus. With plenty of time, I decided to spy out the first part of the route, to the Bridge, and also to try again to find any remnants of the other, wooden bridge (and its tracks) that crossed the river near the concrete and steel one. I parked the bike next to the Bridge over the Kwae and took a few pictures, then wandered off round the back streets of the town. A few minutes before the train was due to start, I made for open country. While hunting out the first level crossing, I found a new lane on the opposite bank to the town, and also found a new road bridge: previously I had thought it was a footbridge. Local knowledge comes in handy at times. The rail bridge was about one kilometre upstream so I was too far for any photographs. At 1030, I went back to the first level crossing, and waited. Locals passing thought it was hilarious, this Westerner, with the BMW motorbike, reflective Sam Browne over the jacket, sweating, stood there waiting for an old train. It takes all kinds of course. 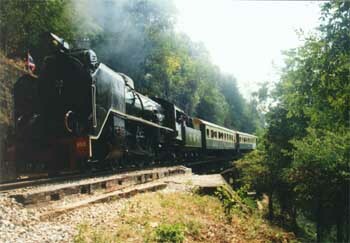 I heard the whistle, and saw the smoke through the trees, and at about 1040, heard the sound of the moving train. I had already chosen my position for the first shots, and as it came into view, moving surprisingly quickly, I took as many as I could. I had taken one roll in the station and guessed that I would have to take as many as possible to get maybe a dozen that were usable. 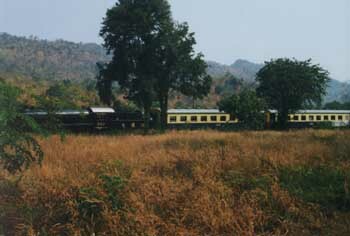 As the train passed, the engineers and passengers waved: it looked like a fun trip. Once out of sight round the bend, I grabbed the helmet, grabbed a gear and grabbed a handful of throttle. 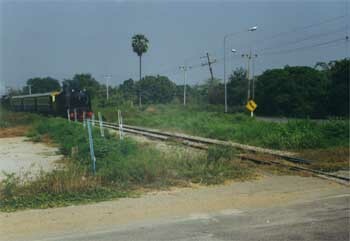 The next level crossing was about 8 kms down the twisty road and I was not sure how long I, or the train, would take. In the event, I made it with a couple of minutes to spare and set myself up again for some photographs. This time, as the train passed, I could see that one or two, and certainly the engineer in the rear locomotive, were asking the question, Didn't we just see him down the road? Once the train had gone, I had a longish trip to the next level crossing and beat the train by a good five minutes: they went round the hills, I went over the top. This time they were expecting me to be there and lots more of the passengers were waving. The engineer at the back was beaming. It was fortunate that I knew the road as its twists and turns take a bit of an effort. I normally ride quite slowly along this road so moving faster was a novel experience for me. But this was fun. At the fourth crossing, I dropped the lens. Vibration must have loosened it and it dropped in the dust. A quick examination revealed no apparent damage, and a quick clean with some tissue had it back on the camera before the train hove into sight. At the fifth crossing I again had a wait of about five minutes before the train could be heard panting down the track and then whistling on its final approach to the crossing. I had not heard anything like this for years. I headed off then down the bumpy road that passes the ancient city of Prasat Muang Singh. Across the fields I could see the train and was surprised how quickly I could pass it on a parallel road. 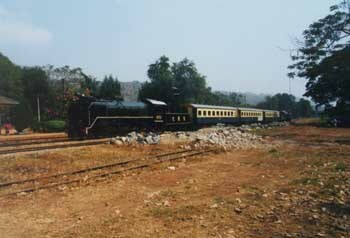 I decided to forgo pictures at the next crossing, as I knew that, after Prasat Muang Singh, the track went straight towards Wang Po viaduct, while the road has a detour of several kilometers--out to the main Burma Highway up the hills there, and then back down into the valley of Saiyoke, and Wang Po railway station. I wanted to catch the train coming across the viaduct--those creaky wooden trestles that cling to the side of the cliff--so at the bottom of the hill, I turned left, down the track that leads to the river. I was surprised at how many people were here. I was also surprised at the high price of a can of drink: 20 baht, when it costs 12 baht in Bangkok. "Got to come a long way," was the explanation. Bring your own, was the thought that replied. Once the bike was parked, I spent a couple of minutes getting the trousers outside the boots again, then walked off down the track and onto the viaduct. I had gone only about 200 metres when the whistle announced the imminent arrival of the train and the black nose appeared round the corner. 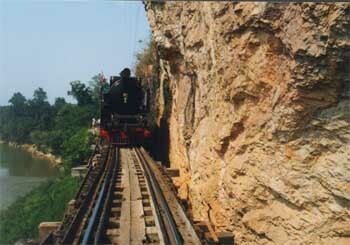 I stood at the side of the track as it came close, and took several pictures. As the engineer in the rear locomotive passed his expression said, "There's that man again", and we both grinned at each other. 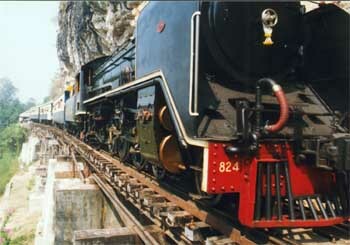 The train runs along the viaduct at less than a walking pace--easy to keep up. 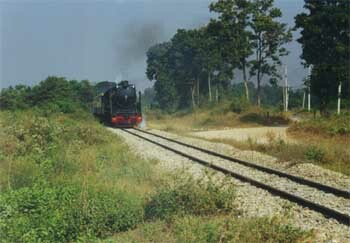 As the rear engine faces back the way the train has come, in the photographs, it looks as if the train is coming towards me. I rather like this effect. The train stopped at the halt at the end of the viaduct for a minute or so, and I got on the bike. Halfway between the halt and Wang Po, I parked up and stood on some old concrete pipes to get a couple of distant shots of the train as it passed by. Back on the bike again, I was in Wang Po before the train and watched as it pulled slowly in and hissed to a stop. While the passengers disembarked, I went for a wander along the train and then back to the front where, this being Thailand, the engineer of the front locomotive had allowed some of the passengers up into his office for a closer look at the controls. I walked a short way into the village and bought a (cheaper) drink. I noticed that a number of passengers were getting into minibuses. Talking to an Australian, who asked me about my chasing the train, who was also going back by this means, he told me that the trip had been organised by another person and he had just joined rather than play golf (sounds eminently sensible to me); so tour agencies in Kanchanaburi are making this sort of arrangement which will cut short an otherwise long day for some. I got back into my riding clothes, and hit the road. The hilly section out of this small town is a lot of fun. The steepness seems hardly to affect the K100 and the series of bends are quite hard to get right. I passed a couple of slow moving cars and a small motorbike with three up. On the main highway I decided to make some speed and get back to Bangkok as soon as I could. Picking off cars is so much enjoyment on this bike, and even the most persistent do tend to give up when pressed for long enough. The man in the blue 5-series took some passing but he did concede that I had the better position for an overtake. I never saw him again. 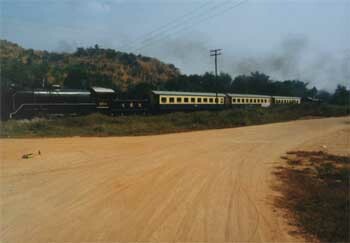 Rounding a long left hand bend close to Kanchanaburi, I saw a car stationary in a side turning quite a way ahead. I passed one car and, coming back to the nearside, became aware (rather than saw) that the gold car was out and taking up the road I should be using. A gentle move to the left without braking took me clear, but not by much. 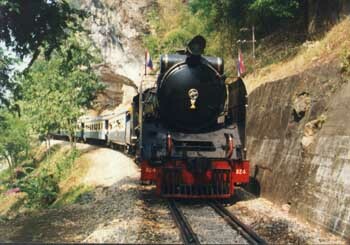 I took the bypass round Kanchanaburi but at the end, looked down and, to my horror, saw that the left pannier was open. I stopped and found that the plastic had been worn away at the front corner and I cursed myself for not seeing it sooner. I lost an old, spare crash helmet too. I had noticed earlier that the catch was open, and simply shut it. I guess the roads out that way had just bounced it open. I shall ride with the panniers locked in future. This being a holiday Friday, the roads back towards the big Mango were packed with some gems of drivers most of whom were convinced of their God-give right to stay in the fast lane until Armageddon. It just takes a little extra work to cope with these. I had to stop in Nakhon Pathom for fuel. I found a Shell station with petrol pumps that speak Thai. They spoke as the girl started the machinery, kept up a running commentary while the tank was filled, then announced the price and gave me the Thai equivalent of "Have a nice day." I think I prefer the hiss of steam.